Opus Pocus is a free and very original puzzle-platformer that is set inside a fantasy pop-up book, offering players the ability to manipulate the scenario to discover new paths and solve puzzles. Created by a group of students from the Vancouver Film School, Opus Pocus is the rare kind of original game that manages to take us back to something from our childhood. 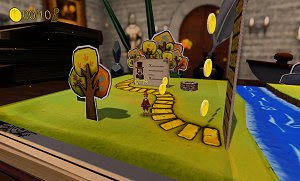 The impressive 3D engine powers the game and offers a cardboard look to the environment, with the player acting as a young magician that has to solve several puzzles to be set free. With ten worlds to explore, our ability to move the pages and change the setting is crucial to reach our destination.